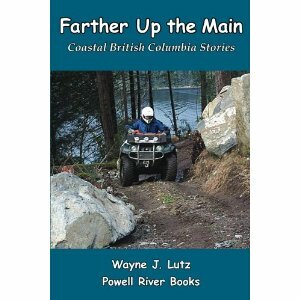 Thirty years ago, Wayne and I visited Powell River while on a flying camping trip. We needed fuel and then walked to the Airport Market for ice and snacks. We hopped back in our plane and away we went -- for twenty more years until we returned to make Powell Lake our home. 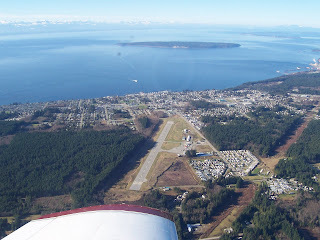 If you would like to read about some of our flying adventures, check out Wayne's Up the Airway. I've often driven passed the Airport Market, but have never stopped. This week I learned from a real estate agent friend, Harry Zroback, that our friend Julie bought the market about six months ago and was having a blast. So today, as I was getting ready to catch a Pacific Coastal flight back to Bellingham, I decided to visit Julie and grab a bite of lunch at her market restaurant. The sign out front says Julie's Airport Market - Grill and Groceries. Outside, the lot was filled with pickup trucks, so I knew the food was going to be good and plentiful. Besides, I know Julie and her pride in a job well done. Inside there is one shelf of emergency items a passing pilot or nearby neighbor might want, but the emphasis is on the restaurant part of the business. And there was Julie, doing a bit of everything: taking orders, manning the till, cooking, and serving. Julie asked if I wanted breakfast or lunch. Lunch I said, and she directed me to the specials board. I picked the steak sandwich. It came medium, just like I ordered, on top of garlic toast, covered with grilled mushrooms and garnished with onion rings. The side of fries was crispy and huge. A meal fit for a logger, but I gave it my best. You can bet I will be heading back to the Airport Market for breakfast or lunch on my next trip to town. 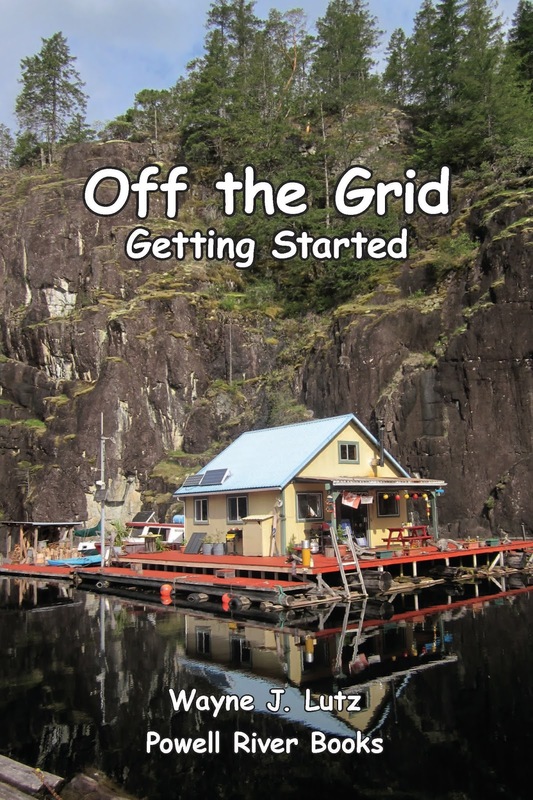 Saving, reusing and repurposing are a way of life at the cabin. I'm bad about maximizing things when in town, but this week I was in cabin mode, and decided to give a floating Rubber Duckies a new lease on life. He has served us well brightening our natural swimming pool. But he lost his yellow feathers and ruby red bill. The only survivor are his shades. He must be a USC (University of Southern California) Band Ducky. They never go anywhere without their dark glasses. So I got out my acrylic paints and got to work. Now Ducky wants to know. Can you tell the difference between his new suit of clothes and his mint fresh cousin? 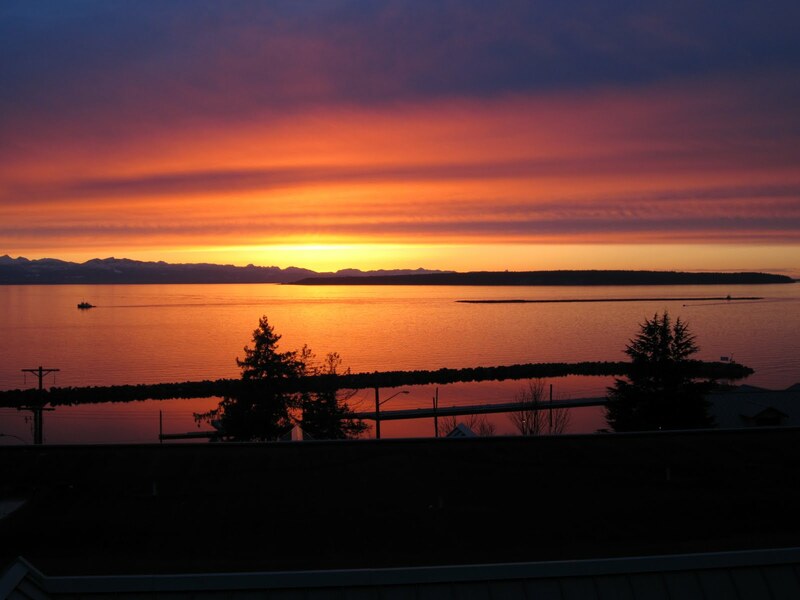 Today's Sky Watch photograph comes to you thanks to my husband Wayne who is up in Powell River. 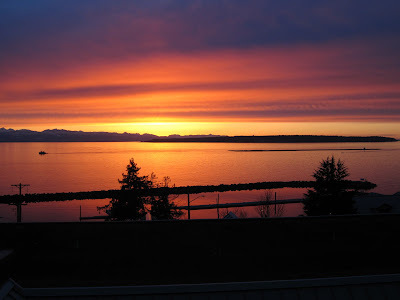 The sunsets are incredible as you can see. In the background is a common sight, a tug towing a large boom of logs south to Vancouver for milling or sale to places such as the United States, China and Japan. In the foreground is Powell River's North Harbour which is undergoing reconstruction. Wayne and I have a new "toy" here in Bellingham. Well, it's a bit big to call a toy, it's a 24.5' Bayliner we got at the Bellingham location of Lake Union Sea Ray. We took possession over a week ago, but the weather had other plans. But over the weekend, we got our first good weather window. The wind still had the bay churned up so we slept on The Bellingham Boat (she came without a name) in her slip at Squalicum Harbor. The morning dawned clearer than forecast, but there was still a breeze. We decided to get some breakfast at the Bayside Cafe then Wayne did a few onboard chores while I read in the sun on the back deck. By afternoon, the wind calmed so we took The Bellingham Boat out for her first day cruise to nearby Chuckanut Bay we read about in A Dreamspeaker Cruising Guide: The San Juan Islands. We entered Chuckanut Bay on the south side of Chuckanut Island. We wanted to check out Pleasant Bay listed as a good overnight anchorage. While it was a beautiful spot, nearby waterfront homes made it less desirable for us. There was one less populated section by the point, but we decided to head up to the north end of the large open bay. Here the train trestle cuts off the deeper water of the outer bay from the shallow inner bay where Chuckanut Creek enters the sea. This is the main north-south rail for passenger and freight trains. I'm sure the sound of the train whistles at night could be a distraction, but they also have an intriguing quality. I want to go back to see a train as it exits the tunnel and lumbers across the trestle. Today's trip was also a test of our new anchor system. This boat came without one. Wayne installed a roller and purchased an anchor, chain and rode at West Marine. We dropped a day hook to sit and read in the last of the warm(ish) afternoon sunshine. I waited until my last morning at the cabin to head down the lake for Powell River and my waiting Pacific Coastal Airlines flight. The low pressure weather system moved through the night before, making the lake safe to navigate once again. Last week at the cabin my goal was to dig up the last of my annual crops in the floating garden and prepare the soil for the coming season. My efforts were thwarted by rain, wind and frozen ground. But I was able to clear one bed of Swiss chard and carrots. The chard gave me enough good leaves for a pot of soup. The carrots were another story. I got lots of crisp ones to preserve for later use. First I pulled all of my remaining crop and discarded any damaged ones. I removed and composted all the carrots tops. I arranged the unwashed carrots on newspaper to dry a bit. 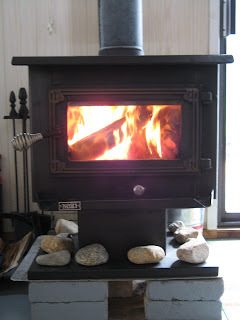 It was so wet and windy outside, this year I did it overnight on the kitchen floor. In the morning, I rubbed off the excess dirt with a dry paper towel. The next step was to arrange the cleaned (not washed) carrots in plastic trays I purchased at the Dollar Store. OK, it was hard not to engage in a bit of vegetable humour by making Veggie Man with a fanged carrot and a leftover beet. The open sides of the plastic tray allow air to circulate. This helps reduce mold or rot as time goes by. I started with a damp paper towel on the bottom covered by a folded sheet of dry newspaper. The damp towel helps increase atmospheric moisture which helps keep the root crops crisper while being stored out of the ground. After one layer of veggies I folded a sheet of newspaper and then added a second layer to each basket. 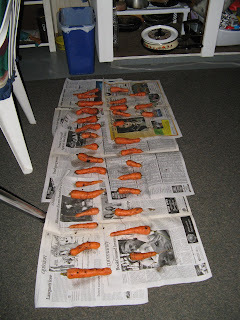 The final step was to cover the top layer of carrots with folded newspaper, a layer of moist paper towel and finally another folded newspaper. To store the baskets, I place them under the bed in my downstairs guest bedroom. It is the coolest room in my cabin. Last week I was alone at the float cabin. I don't like cooking for one, so a simple homemade soup seemed to fit the bill. 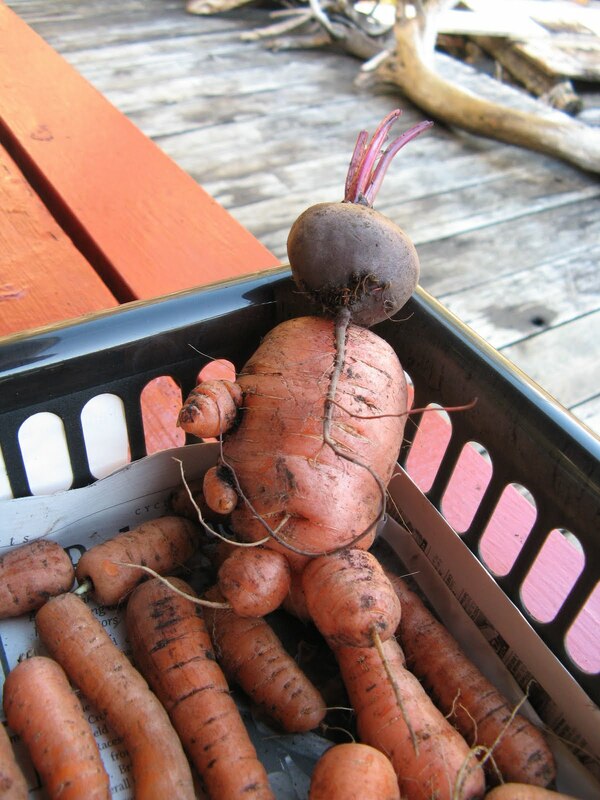 Wayne left some roast beef in the fridge (he does cook for one) and I always have a few root veggies on hand. With a few fresh 'shrooms I grabbed in town, I had all the fixin's needed. Time flies, and so does Pacific Coastal Airlines. 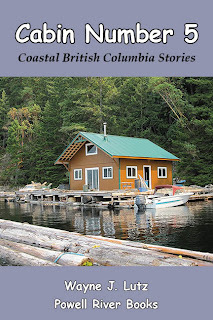 Ever since Wayne and I started going to Powell River, we've used Pacific Coastal as a quick way to get north. I've always heard the founder is a Powell River "local," but I didn't know the whole story. In November 2010, a book was launched that answers all the questions. 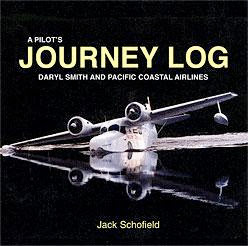 It's A Pilot's Journey Log: Daryl Smith and Pacific Coastal Airlines by Jack Schofield. Daryl Smith is what I would call a typical Coastal BC entrepreneur. 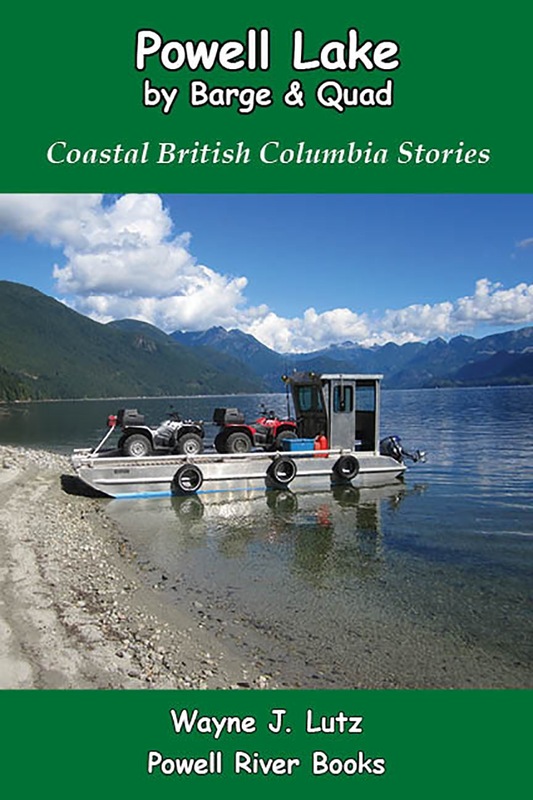 He grew up on the coast where his father worked following jobs in the logging industry. Daryl did his share before learning to fly and staring a series of bush pilot jobs and fledgling "airlines." The workhorse of the coast was and is a floatplane. Daryl cut his teeth on them, but now has experience with a lot of "heavy metal." Growing form one plane Wilderness Airlines in Bella Coola to a fleet of 24 planes including the the Saab 340A, the Shorts S360 and the Beechcraft 1900C. While Daryl Smith has been successful in BC aviation history, there have been lots of other players that didn't have the "right stuff." Get A Pilot's Journey and follow along on this high flying adventure. Up at the cabin, we are often on the dividing line between rain and snow. On Sunday, when we arrived, there was about four inches of the white fluffy stuff all over the deck. But by morning, it had all but melted. Temperatures hovered around 2 degrees C at night and 5 degrees during the day. Consequently, I could watch the snow falling on Goat Island above me. And rain at lake level in front of me. Quite an interesting weather phenomena.